Faceted rose quartz heart earrings in sterling silver. These fabulous drop earrings feature delicate pink, rose quartz hearts and are sure to be favourites. 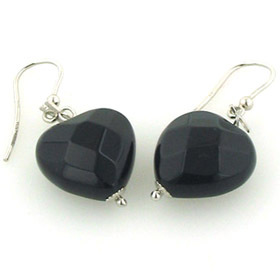 The heart gemstones are faceted on both sides and this gives them shine and twinkle. The hearts are drilled top and bottom with a sterling silver ear wire fixed into the cleft of the heart and a pretty silver cup and ball finishing the point. These rose quartz hearts are natural rose quartz gemstones - not dyed quartz - and they show their authenticity through the fascinating inclusions inside them. These are the result of the evolution of the quartz over centuries. 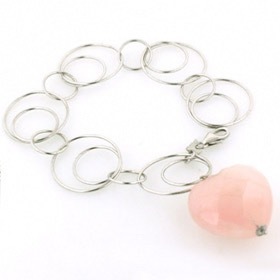 Beautiful on their own, they are also a great accompaniment to our rose quartz bracelet Robyn. These rose quartz earrings are made in Italy by Rajola and gift wrapped in beautiful branded packaging ready to present to your loved one or to treat yourself.